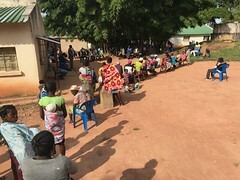 A thirty-year-old woman from our village, whose smiling disposition has cheered me many times when she’s come to the clinic with her kids, came to our hospital at nine months of gestation after 24hr of labor pain, concerned because it was her 8th pregnancy and she hadn’t delivered quickly, like she had in the past, and she was hemorrhaging profusely. She was only 4cm dilated and the baby was fine, confirmed by ultrasound, and no other concerns were noted, like the placenta separating from the uterus or blocking the cervix. I ruptured her membranes, which often helps similar delayed labors tremendously. Her hemorrhaging ceased, but over the next 24hr her pains continued with no dilation of her cervix (necessary for progression to delivery). We put her on a labor-enhancing medication and she delivered a screaming, healthy baby boy after just three additional hours. Two hours later she refused a ride from me and walked barefoot a mile home with her newborn and the women who came to support her through her labor. I marveled again at the tremendous value of the “simple” tools we have at our disposal in evidence-based health care, including the accumulated and shared knowledge over many years by clinicians and scientists and the discovery and production of the most incredible medications that we so often take for granted. I witness their tremendous value so many times daily. 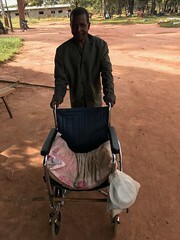 This baby, like so many of our patients, would likely not have survived without intervention and now has the opportunity to grow to know His Father, to love and know love, to serve and encourage his fellow man, and to have a family, from which will arise more families which will produce a different generational landscape than if he hadn’t survived. The incredible humility of our Father is mind-blowing and demonstrated by his allowing us to participate in His continued creating and intervention in this world that He so loves, through education, through medicine, through procreation, through inventions and production of life-saving and life-sustaining tools, through neighborly love, etc. He consistently and so profoundly demonstrates the humility and other-focus that he encourages in those who follow Him! Where there is no access to medical care… A one-year old girl had been in our hospital for a week when I returned from our trip. She determinedly held her head in the sniffing position, had hardly slept for a week (couldn’t lie down) and sounded like she was choking with each inspiration (I could hear her in the hall each morning as I saw other patients). She had been treated with decent antibiotics by our nurses but because she had already survived like that for a week, I treated her with strong anti-inflammatory medicine, along with more appropriate antibiotics, hoping for a trace of improvement, which would be life-saving, but I had little hope for her survival. Because the illness didn’t appear to be surgical, I didn’t immediately transport her to Lubango, though I would have loved to see an x-ray of her neck, suspecting an abscess in her posterior pharynx. She survived for another week like this and I finally transferred her and it appears she will survive what is likely a severe form of pertussis pneumonia (we’ve seen many cases of this completely preventable disease in the last couple months as the vaccines are mostly ineffective because they are not maintained in a cold environment). I still can’t explain all of the upper airway obstruction. What is amazing is that on the day of transport, the family said they were returning to their village because a man there said he could cure her by scraping her throat with a brush! I was furious and they finally relented to flying to Lubango with MAF, all expenses paid by our supporters. My anger wasn’t directed at them as much as at their ignorance of the value of evidence-based medicine, due to poverty and lack of education, infrastructure and health care progress (known to the rest of the world) during thirty years of civil war. At the early morning church service put together for us on our last day in Licua, on our recent trip to the southeast, a man stood and read, for ten minutes, a detailed, by the minute, recount of our agenda over our two days there. “At 8:00 the clinic began, at 12:00 the doctors ate lunch, at 17:45, the clinic closed and the doctors went to the residence for dinner. 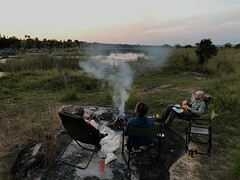 At 19:00 the doctors left the residence and went back to the hospital to sleep…” This is the first time something like this was actually read in our presence, but we believe we are watched this closely at each stop, as virtually no authorities believe that our real purpose here is to help people medically. 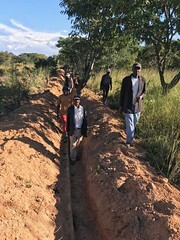 We welcome this week a team of nine men from all over the US, with AGA, led by Paul Hockersmith, to begin the construction project (see photos) of the first new hospital building. 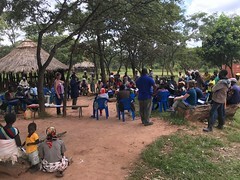 They will train local men, as best they are able with the language differences, to continue the work and they hope to return next year to continue the project. 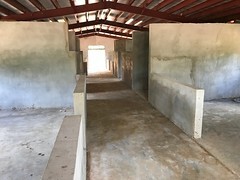 I have supervised local men laying the foundation and cement floor of the first 100x40ft building (photo of completed floor Monday) and this team will hope to put up walls and a roof. 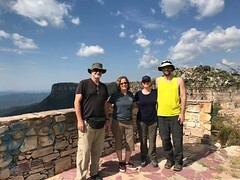 In typical Angolan fashion, the container of building material sent by this team several months ago was delayed at the coast by immigration for no reason, so this team will improvise with what they have (in typical missionary fashion) and hope to still make good progress. 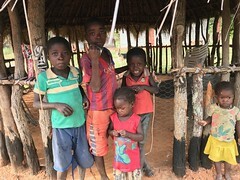 It is so heartening to have people from our country invested so sacrificially in the difficult lives of these rural Angolans. In a couple years our service here might provide a bed and roof for each inpatient, a laboratory, electricity and x-ray, perhaps even a surgery building. Beautiful, indeed! I was to meet with the governor of our province this past week to receive his authorization for our work, so necessary in a police state, where there is much authority and little accountability, as this would prevent local authorities from closing us down for no reason (always possible). We met with him in May to share our need for his authorization and we then, after many delays, set up this follow-up meeting. He gave every indication that he would grant the consent we needed for our work, but… our meeting was cancelled because… he was fired the day before our meeting! Governors here are dismissed and appointed by the all-powerful president and last week the new president “cleaned house” and replaced a number of provincial governors. I had several conversations with this outgoing governor on the phone after his firing and he expressed sorrow for not being able to meet with us and he assured me that he would pass on our needs to the new governor. I hope to meet with her in a couple weeks (after she gets settled in her new role), so please pray with me that our Father would open the necessary doors for a meeting and would grant us favor in her eyes, so that these rural people can be served with excellence for many years to come. The extravagant fine issued last month by the municipal government, because they hunted for, and found, few expired meds in our pharmacy stockroom, was cancelled because of the wise intervention of a church leader on our behalf. He is the volunteer leader of the medical outreach of the denomination which owns our hospital and medical work. 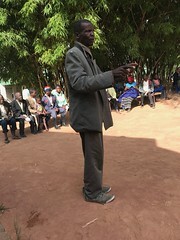 He met with the government leaders last week and expressed remorse for the presence of the expired meds but encouraged these leaders to put it in perspective with the thousands of people served by our clinic, in a country where decent health care and sound medication are difficult to access. They relented quickly and even apologized for the harsh treatment. I was grateful for the wisdom of this leader to respond so wisely and respectfully. We will meet with these leaders in person over the next weeks in a much more amicable setting because of their change of heart. Many people struggle to believe that God communicated to us in letters, through men, remarkably preserved over time, because these writings have been abused, misinterpreted and used for selfish gain since they were written. This logic is flawed and not applied elsewhere. Because something created and beautiful is abused for selfish gain does not negate its beauty. God communicates to us His majesty in so many ways, including through His remarkably detailed creation (most of which we, in all of our 2018 scientific intelligence and “progress”, cannot reproduce) and His creation is often neglected, disregarded and abused. Does this make His creation “untrue” or any less wondrous? Children and women in most cultures are neglected, abused and used for selfish gain and this, in no way, makes them less valuable, beautiful and wondrous. Because evil men abuse and/or disregard something in no way negates its value, but a weird, flawed logic in this regard is applied to the most impressive words ever written, collected in what we call the “bible”, which means simply, “books”. There is plenty of foolish, hateful and hypocritical behavior publicized today about people who say they believe the bible. Does this make the bible untrue, diminish its value or indicate that it wasn’t written by our Father to reveal Himself to us? My life was radically changed many years ago as I read this collection of writings away from any religious influence and I was blown away by the god it revealed, its crazy consistency, its profound wisdom and Jesus’ radically counter-cultural claims, which caused me to completely alter my world view in submission to the Author and His stated desires for us, especially to not “lean on my own understanding”, but to trust Him and His (written) ways as the best approach to whatever brief time we have in this world. There are so many conflicting, smiling voices today saying “This is the way to live” and we each must choose who we will listen to and follow. Jesus said quite plainly that He was “the way, the truth and the life” and the early church proclaimed this so much (in the midst of great persecution) that they were called. “The Way”. In this world, we are encouraged to pursue happiness, comfort, wealth, fulfillment of desire, morality (doing what’s right in our eyes), religion (rules and rituals), discipline, enlightenment, etc. Jesus told us that His way involved abandonment or surrender of the above for a “simple and pure devotion to Him”. Which “way” will we choose today? Thank you for writing, Tim. Your stories are honest, heart-felt and inspiring, often sad, but not despairing. May God continue to give you hope and stamina! This is truly an amazing, wise, and clearly written letter. I have not read such a concise message as this before. The clarity of what you have written has opened up something for me I cannot explain at present. This must be shared.